Richmond is the perfect place tour breweries. Richmond has a great selection of locally made craft beer. Many Richmond area restaurants have a great selection, sometimes you want to go straight to the source. See how its made, talk with the brewer. Here is a list and map of the breweries in Richmond. As you already see the selection is vast and the breweries make some of the best beer on the east coast. 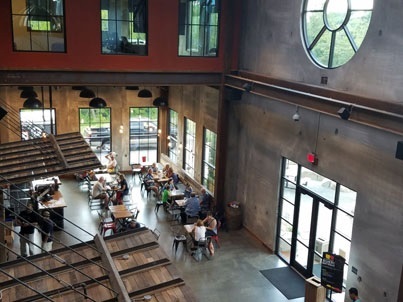 Stone Brewing RVA opened in 2016 east of downtown Richmond within walking distance of Church Hill. A large tasting room along with outdoor seating and brewery tours. Stone offers a wide variety of beers including IPA's and stouts.Stone brewing is pet friendly allow them outside and even some inside. However not for the brew tour. Ardent opened in 2016 in Scott's Addition of Richmond. Ardent offers a great selection of IPA's and seasonal / limited edition brews. Ardent offers indoor and outdoor seating and is pet friendly. Also in Scott's Addition, the Veil offers wide selection of beers.The inside is sparsely decorated with a darker theme with a variety of albino animals.The Veil also has the best names for their beers.such as step dad chaperone. Hardywood Brewing is one of the most popular and fastest growing brewery. They host food trucks and various musical groups on the weekend. Due to a good distribution system, Hardywood already has a large following and by the size of its complex you can tell they have a strong following. Isley Brewing is also in Scotts Addition of Richmond. They have a nice location and selection.They have a large comfortable tasting room and a porch for relaxing outside. Isley is pet friendly and they even allow pets inside. Blue Bee Cider is located in the Manchester section of Richmond. If cider is your flavor, give them a try. Center of the Universe Brewing Company is located in Ashland and is very popular. They offer a great selection of beers. Also having good distribution, you can find their beers at the Baseball park and Kings Dominion. Lickinghole Creek Craft Brewery is located in Goochland County. They have a great wheat beer and a good selection. Triple Crossing Brewing Company located downtown Richmond. The name is from its unique location where three Class 1 railroad tracks cross. Triple Cross is expanding to Fulton Street. Strangeways Brewing is know for unusual mixtures to their beer. Located on Dabney road not too far away from Scotts Addition they have a great selection of different types of beer. If hanging at a brewery is not your thing, then try one of the many restaurants, pubs, bars, or clubs in Richmond. There are many to choose from including some of the best in the country, Mekong on Broad St and Capitol Ale House which has 3 locations around town. Another local favorite is Burger and Brews on Boulivard.